With a descending Sun at the Doddabetta peak behind me, I remember that one evening as I frantically try to climb down the hilly road, snaking the mountain and reaching towards a lesser known Toda settlement. 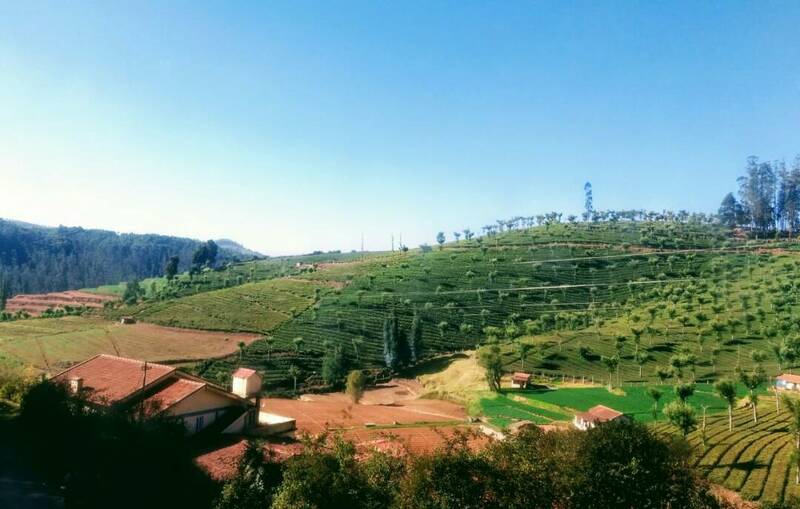 Todas, the ethnic group from Nilgiris, have inhabited Udagamandalam, otherwise adored as Ooty, from time immemorial. In a red saree with messy pleats, I regret not wearing my watch; it is getting darker with every minute and Nilgiri range sanctuary hosts Bengal tigers, I remember. I stopped for a minute beside a wooden house, panting. The town down below is lit up like a constellation of stars. The pale lights are my destination, with resolution I start walking again as a bent-forward old man in white Mundu approached out of the wood cabin. His appearance is somber, with a stick in one hand he offers me a glass of water, invites me inside the house. I tell him my destination is the famed Botanical Garden, a hotel near the downtown, and that I have to rush. He says the road I have taken is a detour. Pointing towards the village, I decided to hike since crowd at Botanical Garden had sent tremors in my mind, he tells me to take the road assuring that leads me to the hotel. I gulp down water from the glass to return with a thanking smile only to find a locked cabin door in my front. No one is near vicinity except faint sounds of transport trucks from faraway passes. 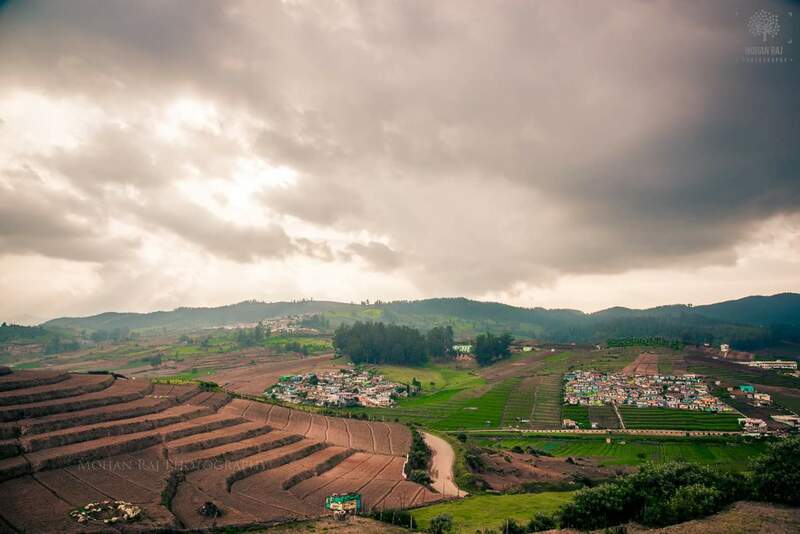 With a tickle in my spine, I realized the hospitable spirit of Ooty. Little is a wonder the mountains carrying British colonial legacy will have stories unheard of. British architecture speaks volume of the days bygone in the Ooty Club that dates back to 1905 AD and still expects guests to deck up with a tie. 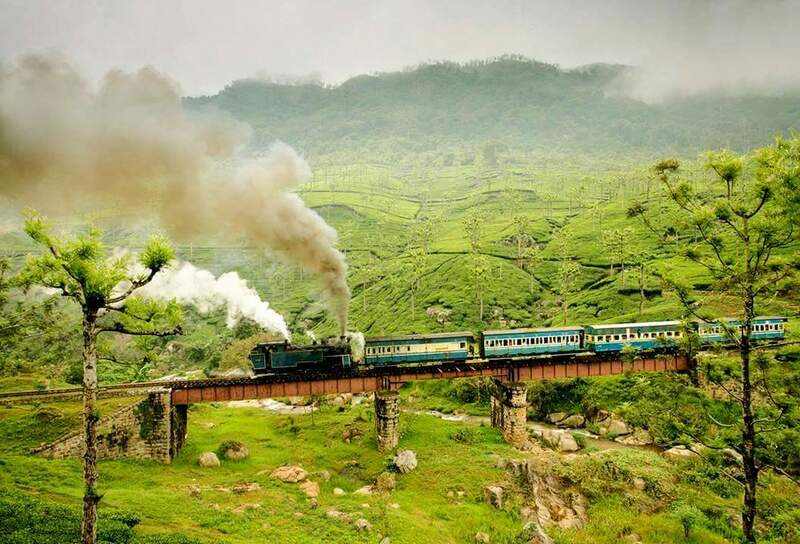 The Coonoor railway, a heritage train experience equating to the Darjeeling Himalaya rail service, descends a pile of tourists, everyday through a picturesque mountain terrain, lined with perfumed berks of eucalyptus. Easiest way to reach Ooty is through a night bus from Bangalore, unless of course you are driving your own vehicle. It takes 12 hours to reach. Make sure you have spoken to the hotel for an early check in. For people not living in Bangalore, a 5 days trip of Bangalore-Mysore-Ooty is much recommended. How many days of stay will suffice? Ooty is ethereal in her beauty. 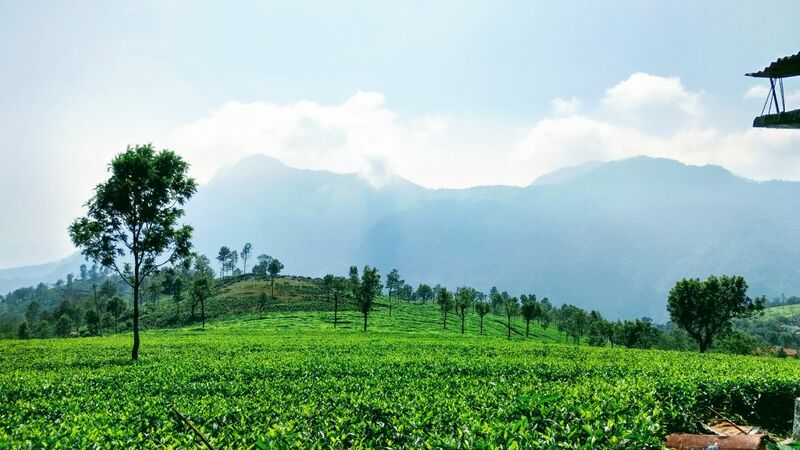 The quaint little town is tucked inside the reserve sanctuary of Mudumalai, covered with a surreal mist of Nilgiris Monsoon. While the touristy major point can be covered in 3 days’ time, for a leisure traveler, an extended week stay would be of preferable. Tourists typically flood the summer session, April to September. Rain in the area can be a cause to limit your activity, hence plan accordingly. Winters are cold but do not expect snow. 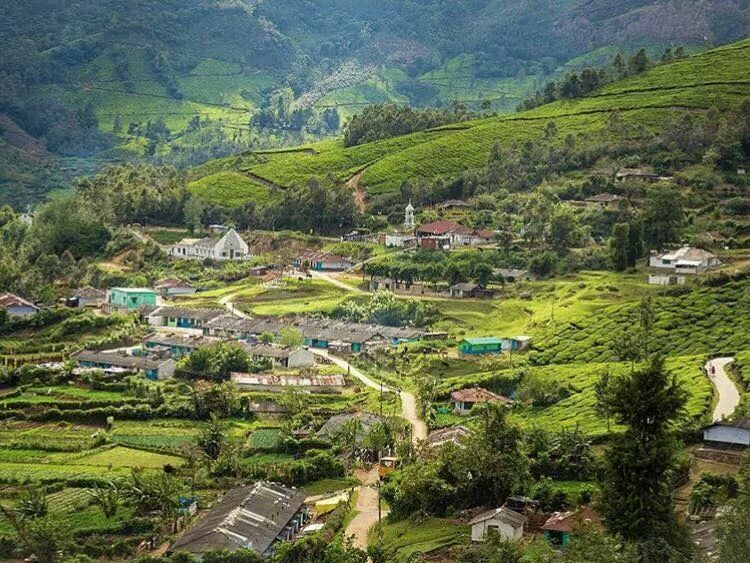 Ooty is also known as Udagamandalam / Ootacamund. It is situated in Tamil-nadu. Majority of locals speak Tamil and English here. 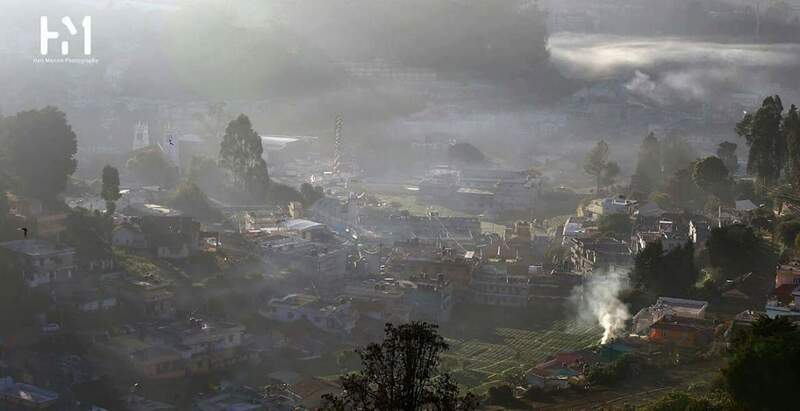 Ooty was the host of the literature fest for 2016. 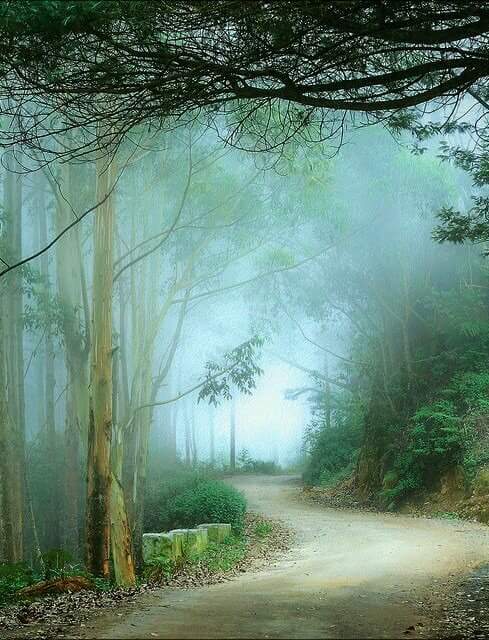 Eucalyptus oil, tea, strawberries are famous collectibles from the place. My love goes for homemade chocolates though. Shahrukh Khan danced on the tunes of Chaiyan Chaiyan on the tracks of Connor railway. For us Bengalis, Mithun da has a house somewhere in the hill. 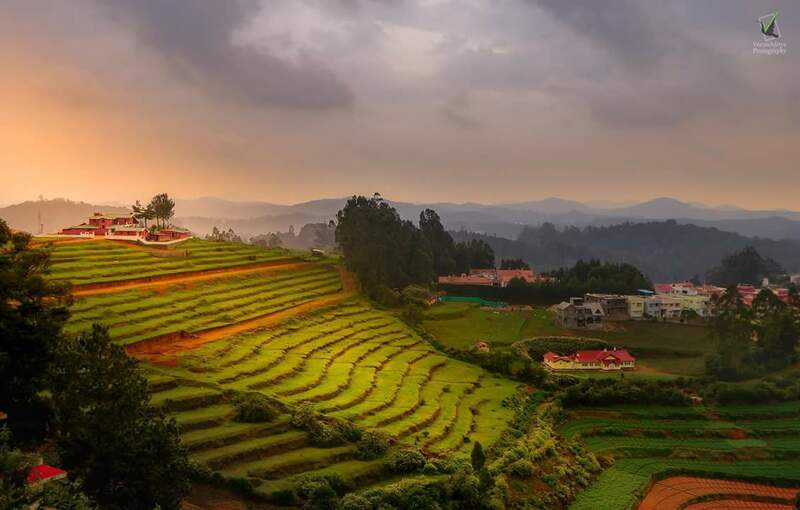 Ooty hosts an array of boarding school in the lap of nature. Minced chicken prawn rolls from Shinkows is an absolute delight while you must not miss their chilly beef. The old school vibe of the Chinese eatery, with restriction on liquor service and red-white check-wards of table mat, won my heart. They serve beef, Pork, Chicken, Prawn and fish. If you want to write your choice and pass the slip to the waiter, an absolutely old world charm, this is the place to be. Do expect a delay in service though. I loved the place as much as I went back the next day for lunch, and waited over 40minutes for placing (read writing on the slip) order. I must mention the small kitchen garden initiative they have taken. Tip: love to munch on vegetarian diet? Do not head for Shinkows, very limited option. I have nothing but my poor memory to blame that I forgot the name of the small rooftop restaurant at the Main Market area. It was run by a British lady with local employees and served delicious Biryani. Busy road, buzzing with business, enthusiastic tourists, people searching for the warmth of alcoholic pleasure, cheap woolens… the list goes on. You can take refuge in a coffee shop and wonder at the rhythm of life. I bought a bottle of eucalyptus oil which lasts till date and works wonder for a stressed day at work. The botanical garden could be a pleasurable experience as I witnessed the colour burst while walking past the fences. However the jam-packed ticket counter had scared me off. I will definitely recommend the place for parents with young children. For those seeking solace, take any of the spiral hilly path and hike up. Be rest assured you will reach a tiny village hidden in the corner Nilgiri. Watch people close by as they live a life with limited amenities of a plain-land but with the abundance of nature. Ideally a one day car booking will take you to the best of travel highlights. Wherever you choose to go, a lake or a forest, you will sooner or later find yourself stranded amidst eucalyptus jungle. The fragnance, insurmountable heights and wildness had left me bewildered, several times. It is a river, named Pykara. On the way to waterfall you will meet few lakes, namely Avaalance and Kamraj Sagar. The lush green surrounding of the lake is vivid in my eyes till date. Pykara was not in her full galore, in the waterfall show she has made for the tourists. Come monsoon, she will flow in all her strength. 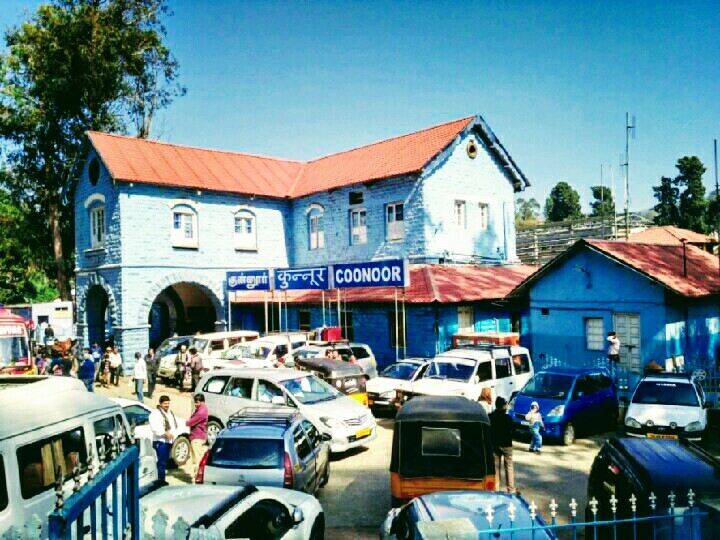 Nilgiri Mountain Railway runs the track through Coonoor. An extremely scenic view it entails on the passengers given that you have taken the care to book it at the earliest date possible. Do not forget to visit John Sullivan’s creation the Ooty lake at the onset of a resting evening. Sullivan is the first one from British East India to foresee the potential of the place back in 1855. For those who have had the great fortune of visiting Mysore Palace, I strongly recommend a visit to Fernhill Palace as well. Built by the same dynasty as a summer resort for the King, the palace as well as the St. Stephen’s Church, one of oldest in the locality, stand witness to changes of many economic and political upheaval of the Southern Indian peninsula. Picture credits mainly goes to my Friends Soumita and Aniruddha, since I was traveling less equipped with a good camera. Oh that is a sweet dish named Mysore paak. 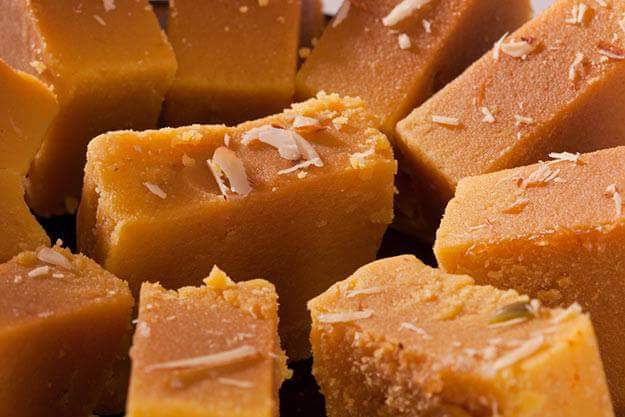 it is a traditional Bengal gram and clarified butter made thing with generous input of milk. 😀 of course we are neighbors. 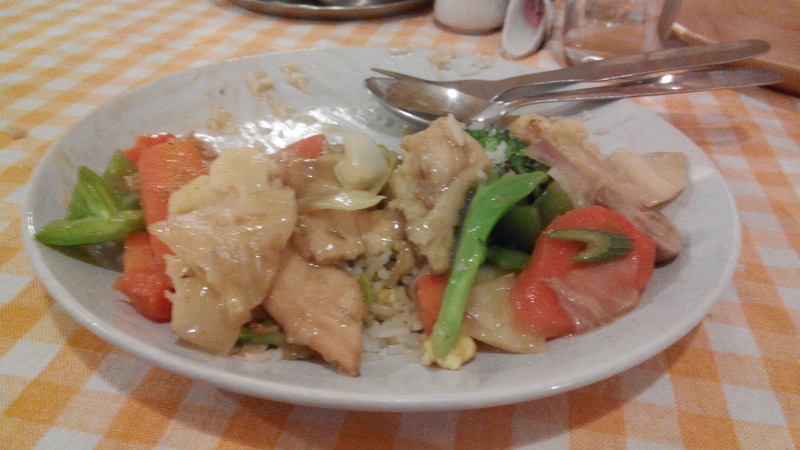 Our food habit will match to a large extent. They sure will neighbour ? I really loved the pictures. Ooty is one of my favourite destinations. Fantastic post! 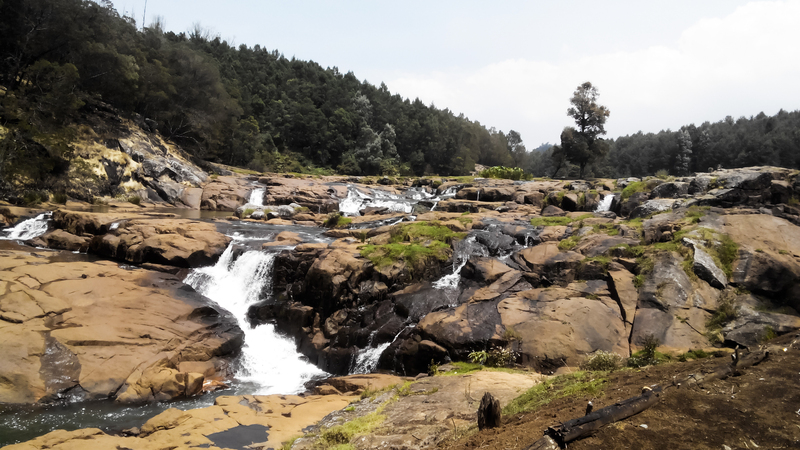 I had been to Ooty several times and yet I missed few of the places you have mentioned! Feel like visiting once more! Ooty is so beautiful! Of course I could not cover all of it at one go. It becomes very hectic in a short trip to make it a point to touchdown all touristy things. My style is to laze around and absorb energy from each places. I loved the Pykara waterfall the most. Yes, I do love the scenic Pykara waterfall ! Wow the pictures are too good ! Not all are clicked by me though. Courtesy is mentioned. 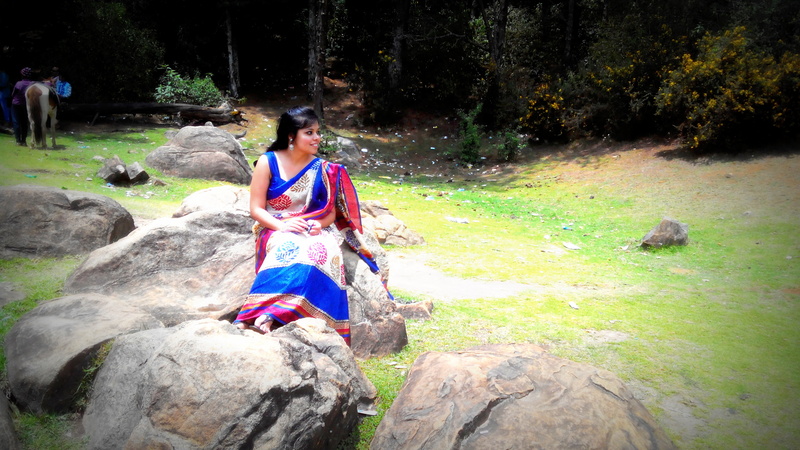 Beautiful pictures and scenery–your saree is gorgeous! I loved your post. You reminded me of my Ooty & Coonoor trip. I did a solo trip around the end of monsoon. It was beautiful at that time. Loved your pics. 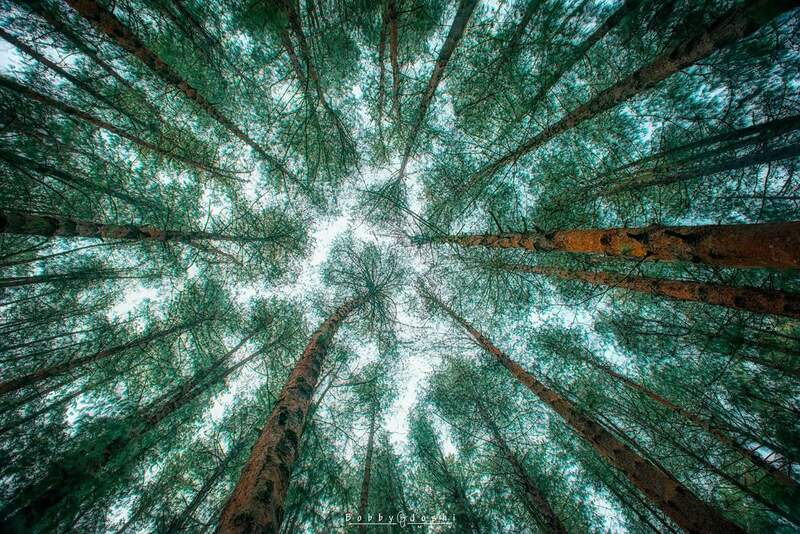 Oh I would love to visit Ooty! Many of my in-laws spent their honeymoon there. I would really like to see the tea plantations and ride the train. The views must be spectacular! What a wonderful description.. pictures are equally amazing ?